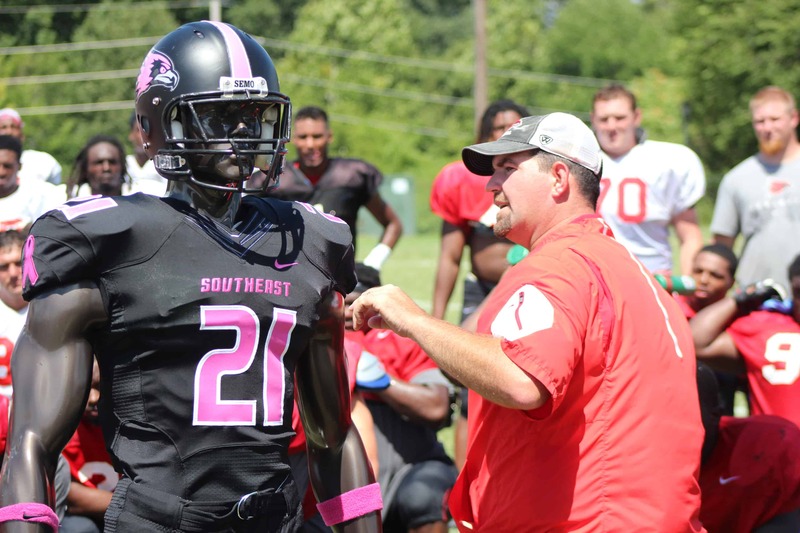 The Southeast Missouri State University football team revealed special new Pink Up jerseys today to be worn during the annual Pink Up game on October 29. The jerseys will be available for purchase through an online auction starting August 12 to raise money for Saint Francis Healthcare System’s Pink Up campaign. This collaboration, led by head coach Tom “Tuke” Matukewicz, is a way for Southeast football to celebrate survivors and honor those who have lost their battles with cancer. The special jerseys will be worn during the Redhawks’ Pink Up game on October 29 against Austin Peay University. Bidding opens August 12 at www.pinkupcape.com. After the auction closes at 5 pm on October 8, the winners will personalize their winning jerseys with a name in honor or memory of a survivor or loved one, if desired. After the game on October 29, the game-worn jerseys will be presented to the winning bidders. The winners will also receive two game tickets and an invitation to a pre-game tailgate party – all in honor and support of Pink Up. Saint Francis launched Pink Up in 2010 to raise awareness of breast cancer in the community. During the campaign, residents are encouraged to “pink up” their homes, businesses and schools in support of the cause. Pink Up proceeds provide free mammograms and other cancer support services to local residents who otherwise could not afford them. Last year’s jersey auction raised $22,000. All 99 jerseys were auctioned off. Since its inception, Pink Up and Dig for Life have provided more than 3,200 free mammograms to community women who could not otherwise afford them. Breast cancer affects one in eight women but by catching it early through important screenings such as mammograms, we have a better chance of beating this disease. Please call 573-331-5133to learn more or to donate to the cause.